Joshua Harker, who lists his professions as ‘artist, sculptor, musician, digital adventurer, imagination architect, troublemaker’ on his website, has built a reputation for sculptures and art work that play with the shape and structure of the human body. Over the last few years he has become one of the leading lights in 3D printed art, with his famous Crania Anatomica Filigre and Anatomica di Revolutis skull pieces. His latest 3D printed creation has debuted to great acclaim on the catwalk of London: the Quixotic Divinity Headdress. Printed in polyamide by selective laser sintering, the extraordinary piece takes its influence from masks and headdresses from Native American, Latin, African and Asian cultures to forge a new, beguiling style – one that is both classic and futuristic. While there are many artists now testing the creative possibilities of additive manufacturing, Harker is quickly becoming the most identifiable, forging a body of 3D printed work that is instantly recognisable as his own. 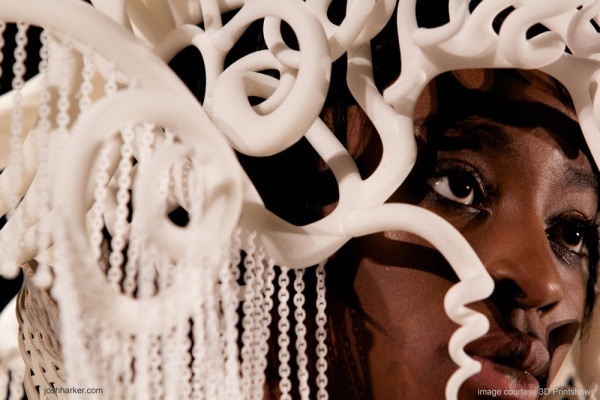 The Quixotic Divinity Headdress will makes its stateside debut in February, 2014, at the 3D Printshow in New York. The search for a truly sustainable, eco-efficient 3D printing filament continues apace. While ABS might be one of the most popular and sturdiest for consumer printing, its toxic, non-biodegradable nature makes it unsound environmentally speaking. PLA, on the other hand, does biodegrade, though it requires 90 degree heat to do so. British designer Alkesh Parmar may have found the answer with his new APeel material. 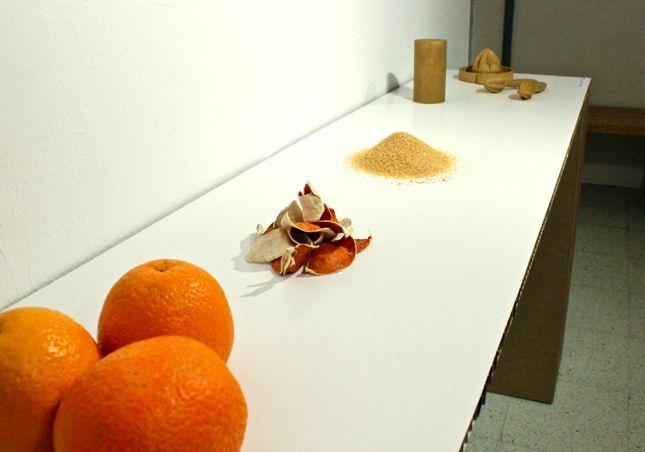 Created by re-using the rind from hespiridium fruits, APeel could potentially be an easily recyclable, compostable filament, ideal for 3D printing. Of course, APeel has plenty of other uses too, as it is firm and strong enough to be utilised in more traditional manufacturing processes. I have been engaged in the research and development of this waste raw materials with aims to achieve a fully biodegradable sustainable material. It is shown that the waste peel, if processed in a particular way, can be transformed into sustainable materials and products with desirable flexibility and strength that could replace conventional non-sustainable ones. For those that don’t know, EcoBots are a type of robot that functions autonomously, fuelled by waste. Over the last 10 years, four generations of EcoBots have been created at the Bristol Robotics Laboratory (BRL), which took waste products like sludge, dead flies and rotten fruit and converted them into electricity. As well as being sustainable, these devices can perform tasks involving either the handling of hazardous material or that take place in areas where there is dangerous pollution. The next generation, produced by researchers at BRL and the University of the West of England’s Centre for Fine Print Research, will features the first ever artificial muscle-driven prototype robotic heart, powered by fuel cells fed with human urine, which was revealed this week. What qualifies it for this list is that it was made using 3D printing. The body and the lid of the robotic heart were created with TangoPlus, a rubbery, soft 3D printing material from Stratasys. While exhibiting the model heart, the researchers showed the actuator perform 33 consecutive actuations on the strength of 2 ml of human urine, with the ability to charge up to 3.5 volts. Researchers stress that this is a ‘proof of concept’ prototype, not the finished article. In fact, the model’s energy conversion efficiency is just 0.11%, which is far too low for a fully functioning EcoBot. The BRL, however, has a $100,000 grant from Bill and Melinda Gates that will, in part, go towards the development of the ‘robot heart’, making for a more effective generation of EcoBots.